Yes, another shawl pattern is in the works. I've written the pattern, but because I work from home, I'm usually a) in my pyjamas or b) wearing a very old dark green fleece jacket with jeans, both with unidentifiable stains or c) wearing no makeup or d) haven't brushed my hair or e) all of the above. Which means that posing for photographs is contraindicated. But here are some sneak preview shots on my lovely mannequin (she always looks her best) of the Sweet Oak Shawl. I'm calling it Sweet Oak, because it uses the same foundation stitch pattern as the Sweet Oak Cardigan. Although the stitch pattern looks like work, it's actually quite easy. There are a lot of rest rows, and all you'll need are yo, k2tog, ssk, sl2-k1-p2sso (a central double decrease). The hardest part of the shawl is the kitchener stitch graft, and that's easy peasy! The yarn is a luxurious 100% silk hand-dyed Sweatermaker Yarns, called Silk 5/2. I used it in the Botanical Cowl. 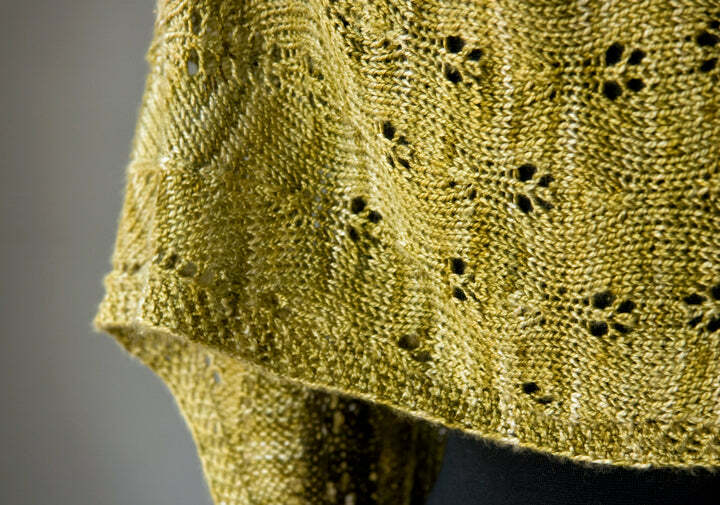 It's lovely in the small cowl, but total luxury in this shawl.